Smiling one of my biggest smiles EVER because I got to play Annie, complete with curly red wig! The year was 1994. I was 14. And I was performing my dream part ... the title role in Annie. 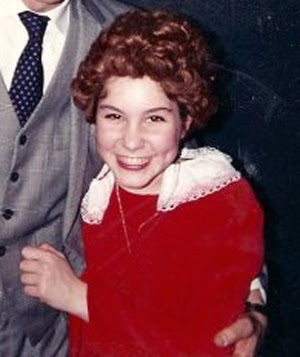 And, while I was definitely obsessed with the fact that I got to sing "Tomorrow" and wear the red dress (though, since this was community theater with some scarcities, we made it a suit), what I always REALLY loved about the character of Annie was her bright red hair. I've wanted to be a redhead for my entire life. And ever since I started dyeing my hair (as far back as 1998), I've chosen red. I know there's a stigma out there about "gingers," but you know what? I don't buy it. My best friend is a redhead, the first boy I ever had a major crush on was a redhead, and I even have a redhead's skin tone (read: so fair I sometimes look see through). But before the hair dyeing began, I got to put on that iconic curly red wig and belt my heart out with the best of 'em. Being Annie was one of the highlights of my musical theater performing life. I wouldn't trade it for anything (even the performance where the dog dragged me off the stage while the ending lyrics to "Tomorrow" were still coming out of my mouth). And getting to wear that wig? I couldn't imagine anything better. Above, a video of me singing "Tomorrow" during my run. Below, a video of me singing "Maybe." And, yes, I did step on a girl's head during the song (which you can hear someone in the audience whisper about when it happens). Oops. Fond memories of your dimple, your delicious singing voice--and your red hair!